A city of 180,000 is about to be built - but before that can happen, there's a few things to sort out. GlastoEarth talks to the man doing the sorting. From the veranda outside Phil Miller's first floor office up at Worthy Farm, there is a majestic view. To you and I it is simply fields and hedgerows draped across a valley, albeit a very special one. For Phil though, it is far more complicated. A puzzle of pipes and wires, waterways and bridges, roads and refuse (and - ahem - human waste), all of which must be made to work before the festival can be built. A budget this year of £1m means he can make big things happen. This Friday, he'll start testing the latest addition, opening the valves on a new million-litre reservoir for drinking water. The new facility will bring capacity up to two million litres - roughly enough for a day's use by the 180,000 temporary residents. It's not been a case of just plugging it into the nearest main though. Last year, Bristol Water had been lowering the pressure in other villages, in order to stop the gulping Glastonbury going thirsty. This year there's no threat of dribbling taps - Michael Eavis has given the water company £365k to upgrade their local infrastructure. Downstream of these giant sealed tanks, Phil's team have replumbed. Against the clock, 6km of dedicated festival water main has been laid. With little time to complete the job, they took an unconventional no-nonsense approach. "We just sliced through everything in our path. They're our pipes, our telephone wires... it's quicker to do that and then fix them afterwards". 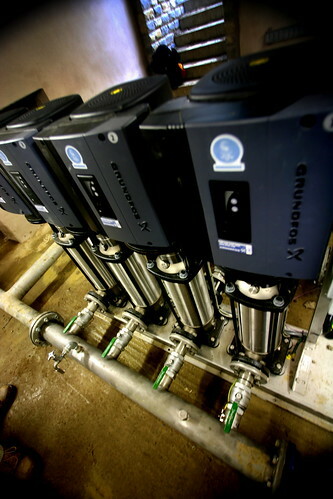 Whilst the upgrade work out in the field is a manual affair, at the heart of the system hi-viz and hard hats are replaced by computerised systems controlling an array of state of the art pumps. The days of these things being supervised by a sleep-deprived steward are long gone. Elsewhere on site bridges are being upgraded - not least of which will be Bella's Bridge, formerly Theatre Bridge. Old canal lock gates from the historic monument Caen Hill will find a new lease of life, with the new bridge being built in memory of festival co-founder Arabella Churchill. This year also brings Phil one of those challenges that only comes around every so often: Football. With England expected to play a critical World Cup game on either Saturday or Sunday - and all the stages booked for acts - the festival of course needs a plan for the inevitable frenzy of red and white. "We've got a dedicated space for it - just west of the Dairy Unit, away from the main venues - with room for 40,000". One of the greenest initiatives has been working with Wessex Water, to deal with that, erm, 'human waste'. In years gone by, a fleet of 32 tankers has ferried sewage to treatment plants. This year, the plan has been turned on it's head. Instead of using more remote plants, open only during limited hours, drivers will instead be working 24 hours a day shipping to facilities much closer to the festival site. The traffic and environment impact is slashed - just two tankers needed for the entire job. There's other environmental initiatives too - the Greenpeace ship being rebuilt from plastic recycled from the festival, and a worm farm for composting food waste. "The planners say they have never seen a three storey, pyramid shaped cow shed like it before. And they argue that if it is just a cow shed why is it rigged with lasers, powerful lighting gantrys and huge sound systems?". This year, the planners finally consented. The frame of the world's most famous stage can stay up for as long as the festival has a licence. And it needn't pretend to be a cowshed. From water to wires, Pyramid to poo trucks, Phil sees it all coming down to one thing - with less time needed to build the festival, Worthy farm can spend more time being a farm. Something the cows would appreciate, one would imagine. Article and photography (C) GlastoEarth 2010.